The Harmony Equine Center trainers and guest clinicians took the reins at the Harmony Horse Expo this year and the newest event at our Harmony Equine Center was one for the books. 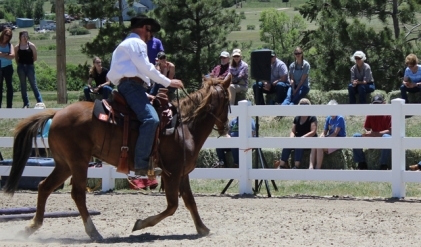 More than a thousand horse enthusiasts joined us for the two-day expo on Friday, June 1 and Saturday, June 2 where they had the chance to learn about the incredible work done at the Harmony. With the wide range of horsemanship trainings, demonstrations and horses available for adoption there was a little of everything for everyone at the event, regardless of equine experience. The Harmony staff of professional trainers and guest clinicians presented on topics that included training the Harmony way, selecting the right horse, building confidence in the horse and rider, advancing your young horse, equine nutrition and vaccinations and many more. Additionally, guests were invited to tour the beautiful 168-acre facility and learn about what a day in the life of the Harmony Equine Center involves – whether it’s rehabilitating horses from a neglect case, helping an owner rehome their horse, training or the hours spent cleaning, feeding and socializing, event attendees were wowed by the dedication and work shown by staff and volunteers. Guests were invited to show their support of the incredible work at the Harmony Equine Center by signing up as monthly donors. New and current supporters enjoyed a VIP area that included a champagne breakfast, presentations, a delicious BBQ lunch and a private extended tour of the facility. If you were unable to attend this year’s Expo or are interested in learning more about the Harmony Equine Center and horses that are available for adoption, visit harmonyequinecenter.org. Special thank you to all the clinicians: Devin Warren, Justin Dunn, Sean Sowa, Ty Webber, Christy Landwehr Certified Horsemanship Association, Dr. Lois Toll Littleton Large Medical Center, Adam Dario Colorado State University Temple Grandin Equine Center, Jessica Dabkowski, Matt Wassam Colorado Saddlery, Mike Brashear, Ben Grogan, Harmony Staff Cori Hoody, Brent Winston, Melissa Marlow and Garret Leonard for using their knowledge and skill set to help horse ownerships excel in their horsemanship.